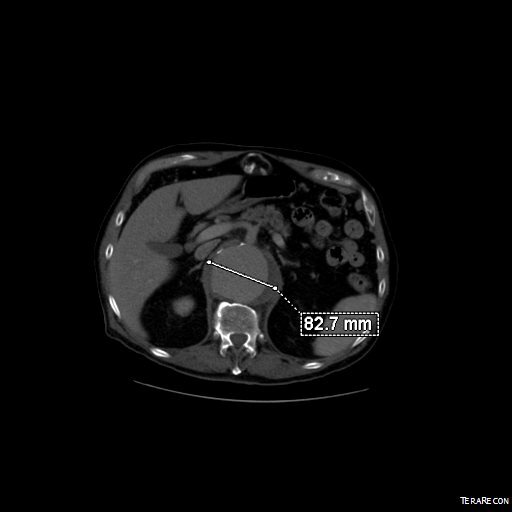 The patient, an active 88 year old man, was transferred from an outside institution after a CT scan revealed a 9cm thoracoabdominal aortic aneurysm on workup of sudden onset back pain. On transfer, his blood pressure was stable but low in the 90’s. On arrival, his blood pressure dropped into the 60’s but responded to resuscitation, and after a detailed conversation with him about the risks of emergent repair, we brought him to the operating room. 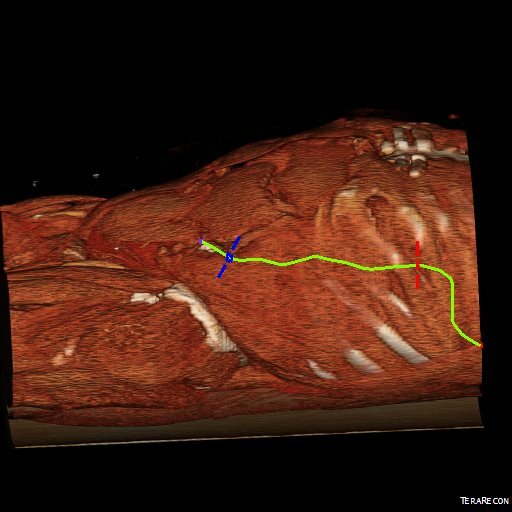 The CT scan showed an 8.3cm extant III thoracabdominal aortic aneurysm which originated slightly above the diaphgragmatic hiatus and extended to the aortic bifurcation in two lobes. The larger lobe involved the visceral vessels and the infrarenal component was about 5cm. While there was no frank rupture on the CT, the outside report mentioned haziness of the posterior wall consistent with ongoing rupture. Examination was significant for hypotension, abdominal and back pain, and a large pulsatile mass in the abdomen. Despite the lack of contrast on this study, I was able to get a centerline reconstruction. The 3D virtual reality view then allows me to plan the operation virtually. The red and blue lines above bracket the beginning and end of the aortic aneurysm with the patient in a right lateral decubitus projection. A thoracoabdominal incision starting on the 8th rib was planned. The patient remained stable through the intubation with a dual lumen endotracheal tube. The chest was entered and the left lung collapsed and the thoracic aorta in the chest was controlled for clamping. The retroperitoneum was dissected and the abdominal contents allowed to fall away exposing the remainder of the aneurysm. The diaphragm was taken down circumferentially. The aneurysm was leaking -not frankly but there was blood visible on the surface like a bruised, overripe plum of unusually large size. The aorta was clamped in the chest after giving the patient 5000 units of heparin -I often don’t if there is a lot of blood loss and I anticipate factor depletion. 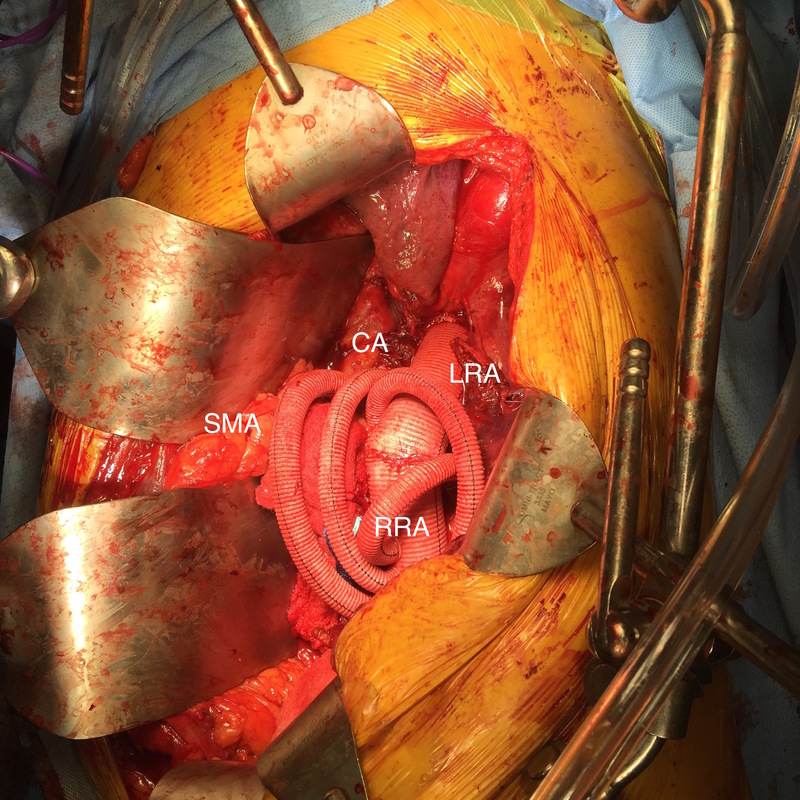 The transdiaphragmatic aorta was controlled and the celiac axis (CA), superior mesenteric artery (SMA), and left renal artery were controlled with vessel loops. The aortic bifurcation was controlled as well after I considered anastomosing to the narrow segment of aorta around the renal arteries. While saving the infrarenal aneurysm for later has an appeal, I feel that if you cut the graft and start sewing to the aorta and find that it is not of good quality, you have wasted time. The aortic clamp was moved down from the chest to the transdiagphragmatic aorta which was now mobilized. This avoided for me some spinal cord ischemia but can be a risky move because the aorta was not healthy even in the nonaneurysmal segments. A 32mm Dacron graft what had 4 branches was brought into the field and anastomosed proximally with 4-0 polypropylene suture. I picked up using narrow gauge suture for aortic anastomoses from my cardiothoracic surgery confreres at the Clinic (Eric Roselli, MD). They will use 5-0 polypropylene with the idea that the smaller needles result in smaller needle holes. I used to use 2-0 suture with an MH needle and have seen my partners be successful at it, often buttressing the anastomosis with a gusset (Dan Clair), but this patient had the tensile strength to take suture well so I went with the smaller SH needle and smaller gauge suture. Other maneuvers include sewing to a strip of Teflon, or in the case of terrible aortic tissues, using interrupted sutures which give some added stability but at the cost of time (credit to Tom Bower). Time is the killer. While cell salvage gives you some margin for blood loss, this is lost with coagulopathy and hypothermia. The grafts to the viscera were sent from distal to proximal -I feel this greatly eases wire access if needed from a femoral access. There can be a problem with twisting, and I avoid this two ways -by allowing for generous length with looping around the main graft to create forgiveness -closing the retroperitoneum inevitably twists the graft -this I credit to my former partner Pat O’Hara who retired last year. The right renal artery received the first graft while cold saline was given to the left renal artery which was revascularized last. Neither had ostial lesions which I have learned to stent with a bare metal stent directly with the artery open -this I credit to Jeanwan Kang, MD, one of my current partners. 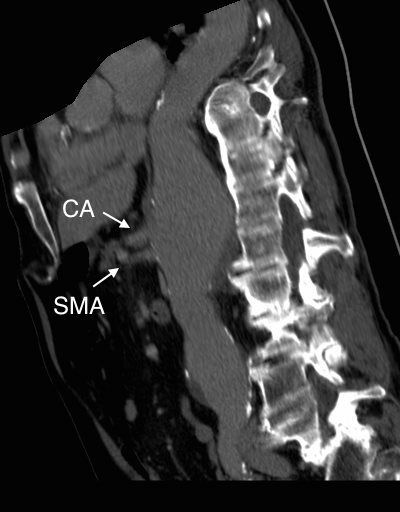 The CA graft resulted in great back bleeding from the SMA. The SMA graft and left renal artery grafts completed the visceral segment of the case. The distal anastomosis was challenging because the bifurcation was heavily calcified. I have to say, the distal often will give me fits when the proximal does not because of the calcium. I generally do perform an endarectomy, but this often results in very poor remnant adventitia. The advice here is be prepared to go distally, but consider that it may add time to the case. The hemostasis was obtained -the most important factor in hemostasis is early and successful repercussion. The wound was restored with repair of the diaphragm, closure of the chest over two chest tubes and closure of the abdomen. The success of these patients only begins with the operation which I cannot do without the active participation of our cardiac anesthesia, nursing, and trainees -our fellow Eric Shang did his work competently. I am fortunate to have strong help in our vascular intensive care unit. There, my patient was actively resuscitated with blood product, stabilized, and weaned off the ventilator within 2 days. Fortunately, he was not paralyzed by this operation which can happen in up to 10% of patient. Also, his renal function stabilized and he never required dialysis. He was eventually discharged to rehab in under 2 weeks. He returned to my office about a month after the rupture, walked in, accompanied by his family. He was making progress with his rehab, and his wounds had healed well. If this was a ruptured infrarenal AAA, the patient had two of the risk factors -age>76 and BP<70mmHg, which conferred a risk of 80% mortality for open repair, which translates to a higher number for thoracoabdominal aortic aneurysm repair. 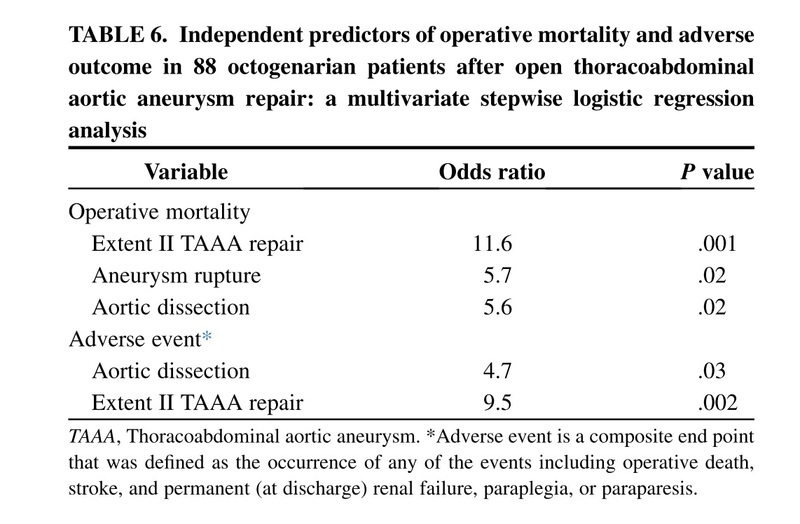 One of our recent aortic fellows, Muhammad Aftab, published the Baylor experience on open repair of TAAA when he was there and found that for open repair, rupture conferred an independent risk for death with a OR of 5.7. 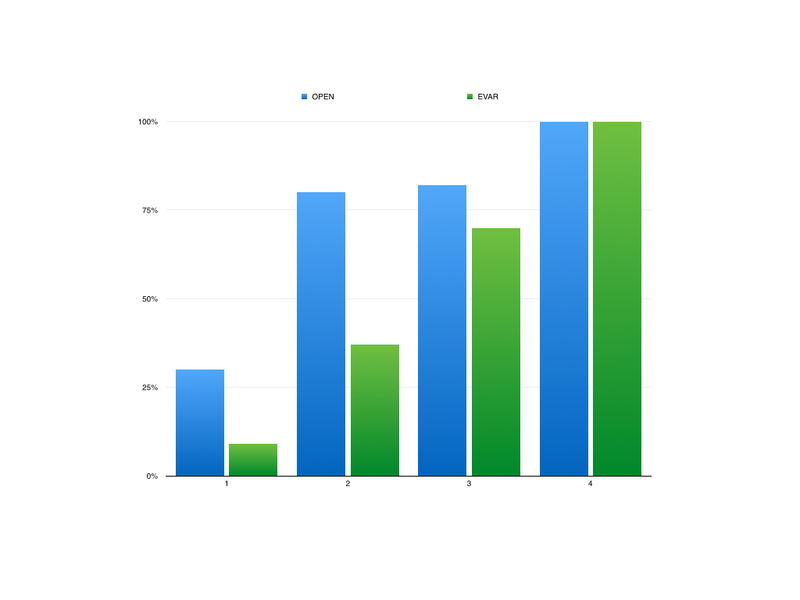 Despite the dismal statistics, several intangibles did favor survival in the patient. He was at 88 still a working professional. He exercised everyday and was fit. He did not drink to excess and never smoked. And he had complete understanding during our preoperative conversation and had a strong grip. And he survived waiting several hours at his hospital for workup and eventual transfer which is a stress test. This last factor accounts for the higher mortality rates for rupture that occurs in hospitals and in places like Seattle where the EMS transport is highly efficient, and better mortality rates at rural referral centers like Mayo where the filtering effect of time leaves a greater proportion of patients likely to survive an operation for rupture.